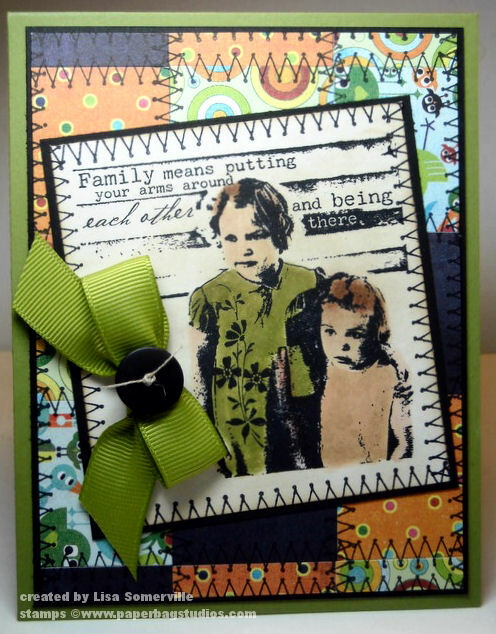 It's time for another Going Grey Challenge at Scrap-Creations, this week Stamp N Plus Scrap N is the sponsor, so be sure to play along for your chance to win a great prize! 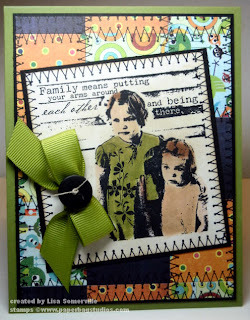 Stamp N Plus Scrap N also has a Blog Hop going on right now, be sure to stop for more inspiration. This weeks Going Grey Challenge is to use any Basic Grey paper along with Three Embellishments. I tend to keep my cards pretty embellishment free, so of course finding the right embellishments to go with my card became a challenge. I used Basic Grey Lime Rickey for my backgound, creating little Quilt Blocks, and stiching them together with Starving Artistamps Stitches and Labels set. I really need to use this set more often for my stitches, it sure beats dragging out the sewing machine! The image is from Paper Bag Studios, stamped in Black Archival on White card stock, then colored using Distress Inks and a Fantastix Blending Tool. The Fantastix Tool works wonderfully for coloring with Distress Inks. After coloring, I blending Old Paper Distress Ink over my panel, then added the Stitching in Black. I used the Bow Easy to tie the Olive Grosgrain, and glued on a Black button I had tied with Linen Thread. This is a FAB card, luv all the hand stiches! lol This would look beautiful framed on my wall! Gorgeous card Lisa! Your hand stitching looks awesome! OH Lisa this card is beautiful! I love the quilting and thought the stitching was real until I read what you wrote. This is a set I need since I am awful with my sewing machine! Wonderful job on this challenge! Great quilt card and you are right, that stitching sure would be easier! Lisa, awesome card. I love the quilt look, and I seriously couldn't even tell that it was "faux" stitching. Fabulous card! The quilt design is the perfect background for that cute image.